Music producer / recording engineer / mixing engineer / mastering engineer Kevin McNoldy's career in music began in Pennsylvania when he begged his parents for piano lessons at the age of three. No teachers would accept a student that young, but a neighborhood pianist was eventually found who embraced his obsession with learning to perform. Non-stop practicing led him to compete in several piano competitions throughout the state. The sound of the instrument was what fascinated him; his constant performing was driven by the richness of sound that enveloped him. This led to songwriting on piano, then saxophone, then guitar, then vocals… and before Kevin knew it, he had written hundreds of songs before even graduating high school. The difference in his writing was that he didn't consider a song finished unless it was recorded--and that was how his spark for engineering began. His after-school activity consisted of recording song after song, day after day. His love for sound brought him to Berklee College of Music, where he earned his degree in music production and engineering under the tutelage of education / production luminaries such as Dave Moulton, Wayne Wadhams, and Robin Coxe-Yeldham. After graduating, he moved to Nashville and designed his first "real studio," a jingle house and mixing room called Dream Sequence Music on the outskirts of Music Row. Kevin produced and composed jingles and advertisements for clients such as Coca Cola, Huggies, MBNA, Bally Fitness, and more, but the drive to produce and engineer records was so strong that he eventually moved to Virginia to set up a studio in the shadow of the Blue Ridge Mountains. It was here that he struck gold with one of his first productions--Seven Mary Three--whose debut album featured the smash hit, Cumbersome. With this success under his belt, Kevin amassed a production and engineering list of hundreds of projects in a short amount of time, with a particular skill for discovering unknown bands and developing them into a major label contract. He found success in a wide variety of different genres--from the heavy rock sounds of Earth To Andy, to the alternative vibe of Clare Quilty, to the folk and bluegrass strummings of Robin and Linda Williams, to the goth/industrial pulse of Bella Morte, to the pop sounds of Ben Arthur and regional favorites Slackjaw, and so many more. During all this activity, he was also working with record labels and music icons such as Mary Chapin Carpenter, The Rowan Brothers, Tim O'Brien, David Nelson, Stuart Duncan, Bill Kirchen, Tony Trischka, Jimmy Gaudreau, Michael Doucet, Mike Seeger, Tim Reynolds, and many, many more. He managed to tour a few times with various bands he produced, even performing on Mountain Stage with Robin and Linda Williams at one point. His next studio design was in Los Angeles, where he capitalized on his success in Virginia by setting up a production room that became the go-to spot for major label work with newly signed bands. The talent pool in Central Virginia soon pulled him back, though, and upon returning to Virginia several years later, he began to plan a huge commercial facility endeavor that would become the highlight of recording for the area. With the design team Recording Architecture of London onboard, Crystalphonic was launched in 2003--a two-story, five-million-dollar monster of a recording studio with an equipment list beyond measure. The studio swiftly became a hot spot for breakout record label releases from artists such as OAR, Blue Merle, Corey Harris, and more (and even hit audiobook releases featuring Sissy Spacek). Included in the four control rooms of the facility was a mastering studio, which became a haven for Kevin's work when he wasn't producing or engineering. It was here that Kevin became recognized as a top-notch mastering and mixing engineer, with work on several Dave Matthews projects, a huge number of record label albums, and by helping to bring new acts such as The Hackensaw Boys and Parachute to the masses. Kevin left Crystalphonic in 2006 to return to independent productions, songwriting, and audio mastering, setting up an experimental studio in Orlando, Florida. It was here where he embraced a "hybrid" approach to recording, with a vast amount of vintage outboard equipment and tape decks combined with an Avid ICON D-Control as the main desk, and ProTools HD as the primary recording and mixing system. The acoustics also took on a different design, with RealTraps modular choices being used so the acoustic signature of the room could be changed at will. Kevin's outboard gear in Florida, up to the ceiling again! Cphonic began as an independent record label to showcase the acts Kevin produced whose songs he co-wrote, but it quickly grew into several facets covering all areas of the recording industry: Cphonic Auctions became one of the most successful pro audio auction companies on Ebay, providing a sales avenue for studios no longer needing legacy equipment; Cphonic Publishing covered the music Kevin was writing with the acts on his label; and through his work with pro audio dealer / studio design firm Magic Audio, he helped to design several major recording studios in the Central Florida region, he became the U.S. distributor for the JazzMutant Lemur (the first multi-touch mixing surface ever introduced, long before the iPhone was released), he designed the website and marketing for German audiophile speaker manufacturer KS Digital, and he became a go-to consultant for training recording studio teams on the organization and effective management of their facilities. He also participated in several music production and recording studio industry panels at the yearly Florida Music Festival during his time in the area. Upon moving to North Carolina several years later, Kevin began constructing an ambitious new project--a 430 square foot audiophile mastering and mixing room called Cphonic Mastering Studio. This studio is the culmination of all of Kevin's thirty years of experience as a music producer, recording engineer, mixing engineer, and mastering engineer. It houses the finest pieces of Kevin's collection of gear, all hand-wired with custom cabling. The acoustics are the most transparent of any room he's ever built, with the most accurate speaker response he's tested in his career. All the various aspects of the Cphonic brand are run from here… with Cphonic Mastering Studio acting as the flagship of the line, providing world-class mastering and mixing for clients around the globe. And Kevin's prolific music career continues, touching on almost every aspect in the industry (from pro audio to studio design to music production to mastering / mixing to songwriting to running an independent record label, he's involved at every level). Kevin has also returned to songwriting, co-writing with artists he’s produced with songs placed in major films and TV series, as well as making the final round of the Grammy Awards for several years in a row. 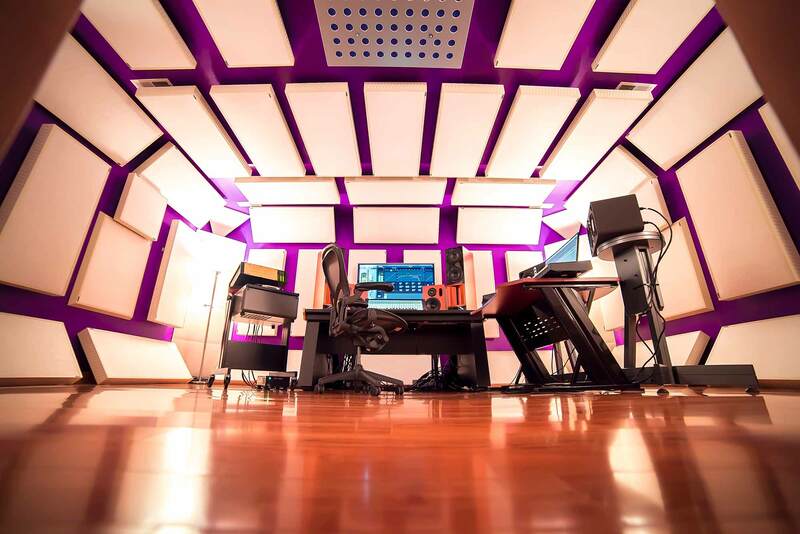 See the Studio Design page for more information on the technical aspects of the room and acoustics, the Equipment page for details on the gear, and the Services section to upload your project or contact Cphonic Mastering Studio.